Includes complete Iran country and several other countries around it, like Iraq, Kuwait, Saudi Arabia, Afghanistan, Turkey, Armenia, Azerbaijan, Bahrain, Quatar and UEA. Persian Gulf is fully featured in this theater. Flying sorties from Saudi Arabia into Iran, acrossing the Persian Gulf is really awesome feeling of entering into enemy territory. 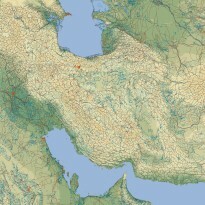 Iran uses the Operation Desert Storm tiles as its the same theater basically regarding the geography area, they overlap a bit. The tiling has been made with CATE autotiler software and there is still some work to do to produce the variety for the terrain tiling. Uses ODS terrain textures / tiles. There are three campaigns in this theater, two fictional US/Coalition vs Iran scenarios, easy and hard, and historical Iran vs Iraq war.